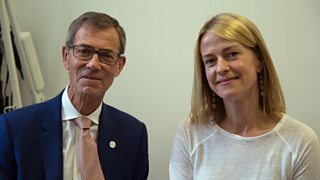 BBC Two - Trust Me, I'm a Doctor, Series 3, Episode 3 - Could viral immunotherapy be a revolution in cancer treatment? As a skin surgeon, Gabriel Weston is all too aware of the terrible consequences of aggressive cancers like the skin cancer melanoma. But a new approach, viral immunotherapy (a form of virotherapy) is being trialled which holds enormous promise for people with previously untreatable cancers. In virotherapy, one disease, in this case herpes, is harnessed and used to attack another. The concept has been around for over 50 years, when it was noted that cancer patients occasionally underwent temporary remission after catching measles, hepatitis or glandular fever. The key advance since then has been genetic engineering, allowing scientists to craft harmless versions of viruses, removing the risk of infection but retaining the elements to help fight the cancer. In the example trial that Gabriel reported on, the virus has firstly been adapted to eliminate two genes - ICP34.5 and ICP47 - so that it won’t be able to reproduce within healthy cells and so multiplies only in cancer cells. Secondly it has also been engineered to produce a molecule called GM-CSF. This alerts the patient's own immune system to the presence of the cancer, allowing it attack and destroy cancer cells wherever they are. This modified virus is known as T-VEC, and it is injected directly into the cancerous cells. The initial trial was led by Professor Kevin Harrington at the Institute of Cancer Research in London, and involved a small group of 17 patients with head and neck cancer. Amongst this small group were some patients that had very encouraging results. Some who had a stage of cancer which would have given them a 30-40% chance of survival with conventional treatment have been more than 5 years in remission, so can be termed as ‘cured’. Although it is impossible to say whether T-VEC itself definitely made the difference, the long-term survival rates were 70%: far greater than would have been expected without this intervention. These results paved the way for further studies, including this new larger trial with T-VEC - this time in the skin cancer melanoma, involving 436 patients. It is too early to say whether the melanoma patients who have gone into remission will be cured of cancer, however, the results have provided much hope. Kevin now plans to combine T-VEC with different immunotherapy drugs, going from a two-pronged to a three-pronged attack. Trials will begin later this year in both melanoma and head and neck patients. The Melanoma phase III trial (called MASTERKEY-265) will randomise patients between PEMBROLIZUMAB and PEMBROLIZUMAB PLUS T-VEC. It will open in late 2015 in a total of 140 sites in 16 countries worldwide. Opening in the UK is anticipated by the end of 2015 (subject to regulatory approvals). A total of 660 patients will be recruited and it is expected that this will take until 2017. The Head and Neck cancer phase Ib trial (MASTERKEY-232) will recruit 40 patients with relapsed and/or metastatic head and neck cancer. All patients will be treated with PEMBROLIZUMAB PLUS T-VEC. It is anticipated that this trial will be open for recruitment in the UK in early 2016. If the phase Ib study shows that the combination is active, a phase III trial will follow. More specific details on when recruitment will be open will be available later in the year from clinicaltrials.gov or Cancer Research UK.